Nowadays chefs in local restaurants are adapting many more dishes from around the world and giving each a personal twist. And the Michelin Guide has been noticing the trend and adding new cadres to the existing Red Guide top starred-restaurants, as well as to the Bib Gourmand ranks. We were in Amsterdam to start a 13-day UNIWORLD River Cruise up the Rhine to Basel in Switzerland (see Legendary Rhine & Moselle River Cruise). While we were there, we tried both Michelin-starred restaurants and street delicacies; the last I remembered from long-ago visits. Both types of food were very impressive! 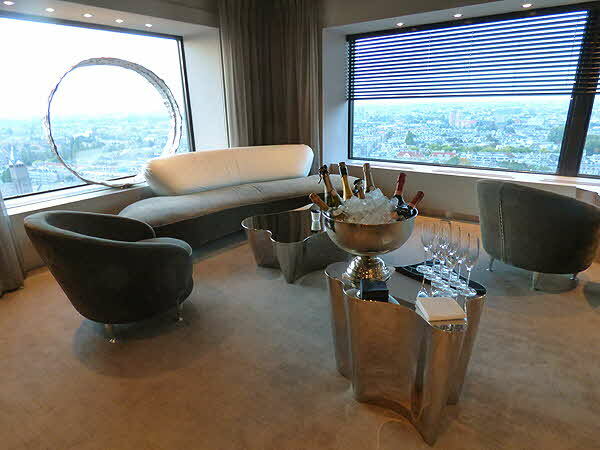 The city view from the 23rd floor is spectacular and so is the tasting menu of Ciel Bleu, the 2 Michelin-star restaurant on the top floor of the Okura Hotel. 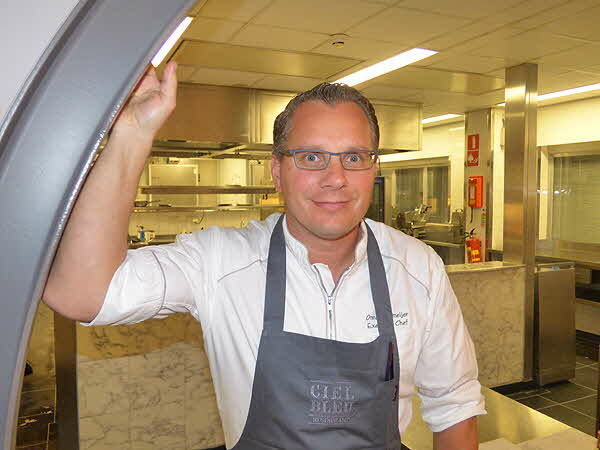 The culinary team of Onno Kokmeijer (executive chef) and Arjan Speelman (chef de cuisine) offers innovative cooking by sampling different cuisines from around the world and getting inspiration from other culinary cultures. This was our first visit to the restaurant. I did not have any pre-conceived ideas other than that the food should be of a certain standard, consistent with my Michelin-star experiences in other European restaurants. And we were not disappointed. One of the hallmarks of a starred kitchen is not only the deliciousness of the food but also impeccable service; and this was really white-gloved service par excellence. The furniture was contemporary and designed to making waiting for your table, if needed, comfortable; the tables were well spaced and the large room can accommodate up to 76 diners. The fact that the restaurant was a bit more casual than similarly starred restaurants in the US -- I’m thinking New York and San Francisco -- was also quite pleasing. I loved the “No Cellphone”�� signs on the tables; does one really have to tell people nowadays they are there to enjoy the ambiance and the food and each other’s company and not to yuck on the phone? We started with glasses of pink champagne and “bites” i.e. appetizers, while we were waiting to be seated. 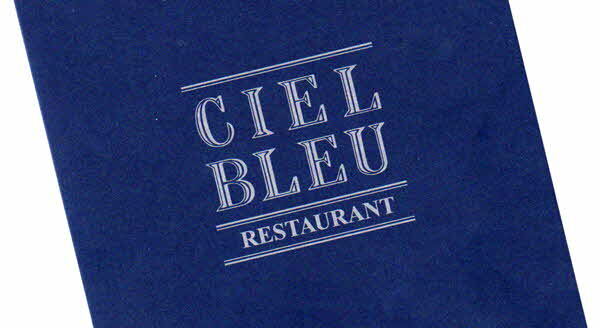 No�l Vanwittenbergh joined Ciel Bleu in 2007 as the sommelier and his wine list has numerous awards from Wine Spectator, Gault-Millau and other food and wine publications. The cellar has some truly exceptional bottles (over 600 labels) and the sommelier and chef team have created some very interesting pairings. 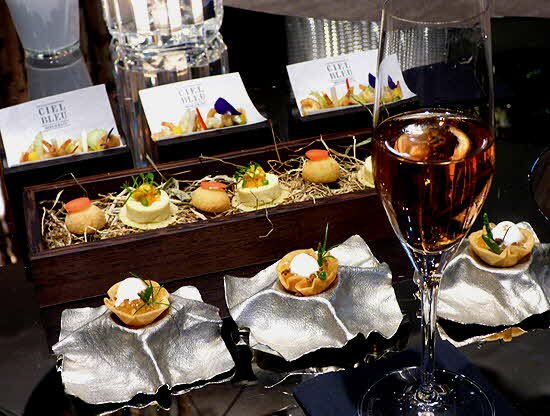 Actually, the first pairing took me completely by surprise when the initial offering of Oyster ‘Royal’ with chorizo, hazelnut and sorrel was paired with one for the best Manzanilla sherries from Sanl�car de Barromeda. I would expect Manzanilla to be served with “tapas”�� but not in Amsterdam with oysters. Bravo!!! In many cases the ingredients of a dish are put together with tweezers to create an assemblage that is as pleasing to the eye as it is to the palate. 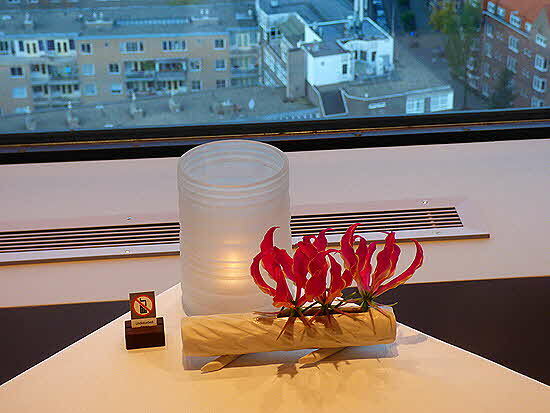 By the way, if you are interested in seeing how a Michelin-starred kitchen actually works and how these exceptional dishes are created, there is a large chef’s table in the kitchen and you could book a seating there. 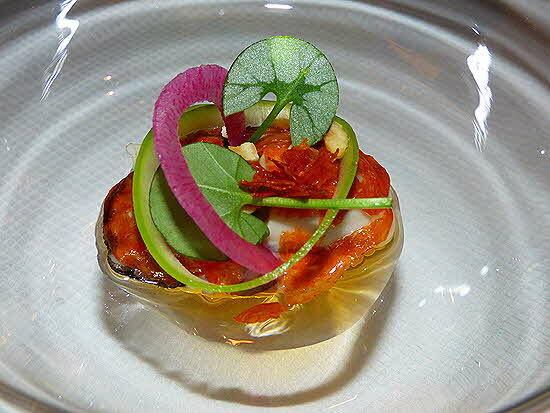 We had the 8-dish tasting menu with wine pairing plus a few additional signature dishes. Some of the menu changes seasonally, and this was autumn, therefore it was populated by mostly fish and seafood. Following the seafood was duck, prepared and served two ways -- which was delightful -- and the last main course was Goose liver with hazelnuts, quince and coffee... absolute yum!!! 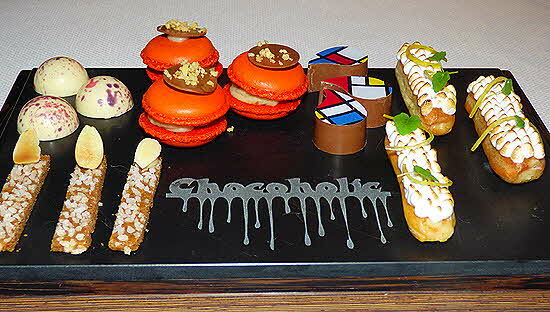 Two desserts followed and then a “Chocoholic” board with incredible white chocolate desserts. 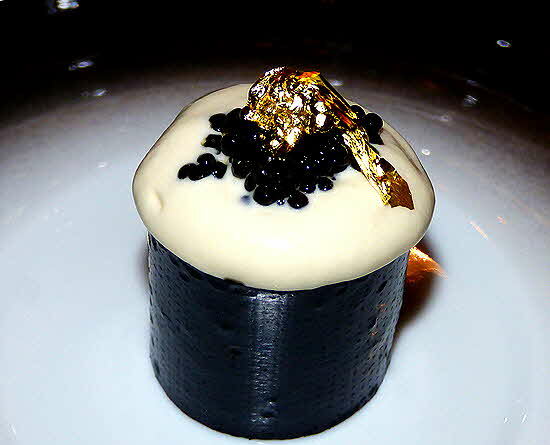 The dishes that I enjoyed most were the King Crab, with Baeri caviar and ice cream of beurre blanc and lemon preserve, topped with a soup�on of edible gold and the Oyster (and I don't normally like raw oysters). As far as the paired wines were concerned, I really enjoyed the 2014 Blanc de Chasse-Spleen, the 2013 Ch�teau Ollieux Romanis from Corbi�res, the 2009 Clos de Sainte Catherine from Domaine des Baumard, in the Loire and the 2015 Moscato d’ Asti from Piemonte. Not that the others were not as good, but these particular bottles seemed to work very well with the dishes they did accompany. So, the 2 Michelin-starred restaurant was exceptional, as I thought it should be. What was unexpected was the high quality of street food that we encountered (see Foodie Paradise in Gastronomy). © January 2017 LuxuryWeb Magazine. All rights reserved.